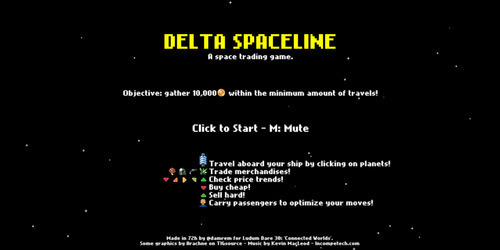 A quick post to invite you to play and rate my game, Delta Space Line, a trading game. Your goal is to gather 10,000 credits in a minimal number of travels. To do so, you control a ship with 6 slots (right sidebar) that you can fill with merchandizes and passengers. Hovering a planet shows you the exchange rate of the 4 types of merchandize (food, metal, weapon, crystal). It should help you making money by buying goods at a cheap price (the current planet market is shown in the left sidebar), then selling them at a better price on planets where the demand is higher. In addition to goods trading, carrying passengers can help you optimize your moves by filling the empty cargo slots. Passengers pay their journey and take off your ship as soon as they reach their destination. …and then actually went for the jam to give myself 72h cause 48h were not enough for me. My game wasn pointless therefore uninteresting at the jam deadline. It lacked 2 of the 3 key features: there was trading goods, but weren’t neither passengers nor 10,000 credit-objective. I’m not sure Haxeflixel actually made me save some time. I’d have needed a lib, not a framework. A lot of UI, no prior design, so I wasted a lot of time positioning things. …but since I’m stubborn, I insisted, at least not to feel ashame. I quickly fixed the bugs thanks to a refactoring I had actually nearly completed. Having 1 more day game me time to add the 2 more key features I spoke of above. I then found an interest in playing my game when I noticed I could lose some time when testing! My very critical wife tested it, and after a few minutes of incomprehension, understood the concept and approved it! This ‘What went right’ section seems a bit short, but I am globally satisfied by both process and result, and I learnt a lot during this jam. I generally enjoy those intense work-session, who can be very productive rewarding. I’ll post Delta Spaceline on various portals to have more feedback. I need to work on the proportion, 960×480 doesn’t fit, at least on Kongregate. More design at the beginning. Design UI could help conceptualize. Then get a fully playable prototype asap, and keep UI and graphics for the end. No use of Haxeflixel, or only some side-feature, not the framework in itself. I wanted to experiment Phaser, but got to check if it can be used as a lib only. No waste of time on graphics. Tiny sprites. Details only at the end. 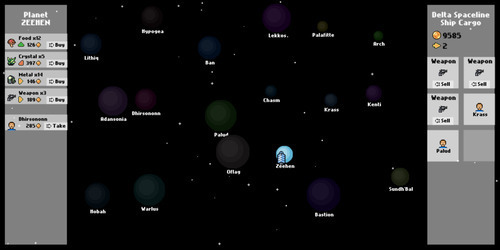 I decided to take part in LD30 a bit late, but here it goes… I am making a space trading game using Haxeflixel under Flash Develop. My main issue now is the inventory management, that I did not forethink enough, so I will have to refactor things towards more mapping. I feel like haxe enums and typedef would be useful here, but 2 days are not enough to play with those… Since I got stuck tonight, did work on the GFX and the UI. I guess I won’t be able to make the original plan, which was to have several ships to manage, to transport people as well as goods, and to defend against space pirates…But got to cut things off! At least, I hope I’ll have time to add some more merchandizes and GFX. Good night to all, and rest well before day #2! Sorry we are a little late for our Post Mortem, but here it is folks ! This was our first game jam together, and even the first game jam for some of us. We are quite satisfied with what we were able to do, and we have learnt a lot. Of course not everything went perfectly, that’s also why we learnt so much, so here is our post mortem in the classical ‘what went right and what went wrong’ format. – We were a bit too ambitious during the brainstorming phase. There were a lot of features in our initial project and we had to cut off a lot of it. But even with a “lighter” project, we finished our game ‘just in time’ letting very little time for tweaking and debugging. That’s probably why our game play is so tricky and our hitbox strange. – Mapping and level design. We left it for the end and then rushed to make some maps. That’s why some map were buggy. Due to our game play, we had to make a LOT of map. – We didn’t knew our tool. We never used haxeflixel before and weren’t really ready for a project. We lost a lot of time searching for way of doing things we needed. – Our developping environment wasn’t fully operational and we lost some time configuring everything. – Random world generation was a really tricky part, even though it was a must have feature for the fun part of our game. – General feedback were good. – We were pretty happy with the final result. – Using haxeflixel was a huge gain of time. – Despite our problem in the begining with our environment, we had a really good workflow. Everyone knew what to do and the task repartition went seamlessly. – We were able to release the game in time. We included all the feature we defined after the cut off. So, here we are ! If you haven’t played at our game yet, don’t hesitate to take a look at it !